The independent cycling organisation, Whycycle, gives three great reasons for getting on your bike. If you want to ride into town, or to the start of a trip by public transport, our low-cost Cycle Hubs and bike lockers across the region mean you can leave your bike without worry. 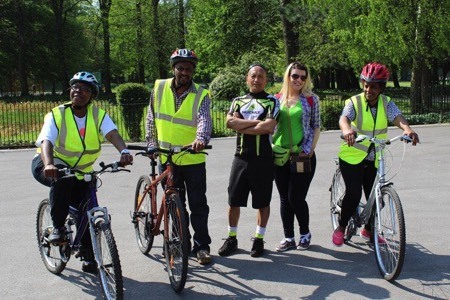 We can help employers and businesses enjoy the benefits of a cycling workforce. Cyclists are generally healthier than average, take less time off work, and reduce pressure on car parks. See how the Travel Choices scheme can help you set up a bike-friendly workplace. Greater Manchester has a growing network of quiet traffic-free cycle routes from urban centres out into the neighbouring countryside. Find a cycle route. Manchester is at the heart of British cycling. If you want to be more adventurous you can try riding on the world-class velodrome, BMX track, or Clayton Vale mountain bike trail - all run by the National Cycling Centre. Or try one of the many mountain bike routes in the region, like the Pennine Bridleway.